There is another mystery left for us to ponder in the land of blog. We do a lot of pondering around here as you know, and I'd hate to give up on any of the good questions. I think this might be one of those. Ready? Here goes. How do you explain the vast divergence between Sho Tay's statement to the Pasadena Star News on Monday ("Arcadia to revisit controversial delayed mayoral appointment" link), and what they've just published now ("After apology, Sho Tay named mayor of Arcadia" link)? We're talking about "The Apology" here, of course. You know, that well flipped one. Just to refresh your memory, here is how the freshly anointed Mayor of Arcadia, Sho Tay, was copiously quoted in Monday's Star News reportage. Tay said he has no intention of admitting guilt to any accusations of lying. He added that because he represents Arcadia’s Chinese community, him admitting to being a liar would mean letting 60 percent of the community be characterized as liars. ... “Before, we used to try to tell everyone we’re the same,” Tay said. “Now they’re trying to say we’re not the same — you guys are Asian — and that’s the wrong message to send out.” Tay had previously said he did not believe race was involved in the decision not to make him mayor, but he said the ongoing conflict has led him to believe race is indeed involved. That was quite a strident statement, and it caused some concern. No apologies will be given being the clearly stated message. But in this latest article, which again is titled "After apology, Sho Tay named Mayor of Arcadia," a very different vibe is sent. Something must have happened between that first statement and the second one. Maybe two things happened, or even more. I'm not sure. But if this was just a mood swing, it is radical enough to give you a pretty severe whiplash. Click here for 'Apology' video. Over at the Voice of Arcadia site they are going a bit "Cuckoo for Cocoa Puffs" over this perplexing apology situation. Check out the video I've posted here in case you have doubts. Obviously what went down Tuesday evening was a bitter experience for the anonymous author of much of the ranting and raving that goes on over there, and the poor fellow can't quite seem to calm his bad self down. Psychologically revealing, in a sense. Like in that "the lady doth protest too much" kind of way. Try digging into this well toasted bowl of frosted flakes. The text in italics below is the VOA take. The “happy” ending did not come without a price. City manager organized a team building session with the council members last Friday with many positive outcomes. 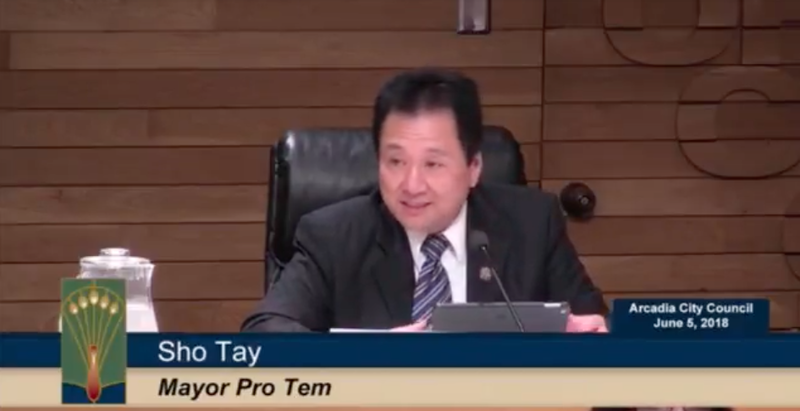 But unfortunately, Mayor Sho Tay was the only one who expressed his sincere and regretful feelings about a contentious campaign mailer to the other council members in this council meeting. One wonders if their meeting is truly team building, why are the other council members not offering their apologies to the public when they were equally under the FPPC investigations and contributed to the wrongdoings in the past campaign? Strong evidences show Tom Beck publicly spread rumors about Sho registering non-citizen Asians to vote. His supporters organized yard sign stealing. A notorious blog published 28 hideous hit pieces on Tom Beck's rivals. This chaos is clearly not one-sided. In order to restore peace, Sho Tay demonstrated the leadership and bit the bullet for the greater good of this community. He calmed down the “crybaby” who apparently is still obsessed with a campaign mailer with some less than perfect choice of words. It is Tom Beck’s loss to show the community that he has an obsessive-compulsive personality. We really appreciate Sho Tay for showing the leadership that Arcadia needs and teaching everyone in our community that you don't back down from a bully. Obsessed and bigoted, Tom Beck put his words into Sho Tay’s mouth. He manipulated the situation and turned Sho Tay's statement of regret into a public apology. Notably, it is Sho's statement that sets an example of restoring peace in Arcadia. Pardon my disbelief, but has such selfless nobility ever been claimed before for a politician who was busted for fibbing on an illegally financed campaign postcard? And then blamed it on a consultant? I think that VOA dude needs to get some rest before he hurts himself. I'm at a loss for words of what's going on? Pretty much what you can look forward to for the next year. The war over development continues unabated. To retain control of development in Arcadia is a rocky road. Support Peter, Tom. and April for our best chance to get reasonable development. Don't let money win. Keep your eyes on the prize. Don't get distracted by the circus. Don't you know that VOA the consultant? The one referenced by Sho Tay? Wonder if he listed a consultant on his legally required forms? Lisa M better get after him. She won't. She was helping Roger in the police badges incident. What make you assuming she will go after him. She will only fallow his paper trial around and asking him for correction on the papers. Sho Tay has a perpetual habit of blaming mysterious others. Curious isn't it? He can never document that who he is blaming is a "real" person. A lie for a lie for a lie for a lie and so on and so on and so on ................. . . . The VOA dude touts that ALL the words coming from Sho's mouth are the REAL truth. Then we all heard Sho confess that the flyer did not represent the truth. To put in another way, he had lied then offered his apology. Must be the truth? Perhaps the VOA dude got lost and confused between the flip flops. I think Sho's actions were based on who he talked to last. 1) First he heard from his fellow councilmembers at the team building meeting, and agreed to confess. 2) Then he heard from the development gang, and claimed in the Pasadena Star News that he would never do such a thing. 3) Then he met with the City Councilmembers again on Tuesday, and flipped back to #1. This is all just a guess, but how else can it be explained? Take your seasick pills if you live in Arcadia. Constant motion. Flip flop, hang upside down, rise and fall, tall tales and lies. Developers on the move -good as long as they are walking the plank. Slosh, splash, splatter. 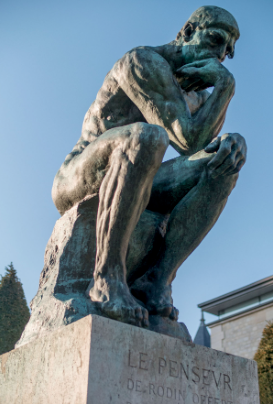 Rodin, "Le Pensevr" one of his most notable castings; public ART should be supported by all. LOL, lucky that's all that hurts. Most if not ALL professional Politicians' live in a parallel universe much like 'donald j trump' reality has nothing to do with them what's so ever! They believe they are the center of the universe, but that's the difference with them and US they believing they are untouchable and above any and all moral laws. The text in italics is from the VOA? I got a bit lost trying to follow this just now. I reworded so that it is more clear. Thanks for pointing this out. So true 7:54am, look at the lucrative deal with Netflix's the Obama duel just pulled off. Netflix's; the new Obama Networks of slanted government broadcasting and films. How do any of these Councilmember's get anything of real value done for the City of Arcadia? You have to remember what is really driving this situation. It's mansionization and money. It is a battle for the future of Arcadia. Step one is to ignore the crazy Shobots and do what is right. Make sure to send emails to April, Tom. and Peter letting them know they are supported. Peter in particular needs help to keep his courage up. The VOA dude is small potatoes. Just noisy. Ignore the child having a temper tantrum. If Peter can dredge up his mojo than there will be three (Peter, April, Tom). Irrational thinkers must be ignored. An example is David Liu - actually just a bit player with crazy claims. It's all an act. Designed to distract people from the real issue, which is out of control mansionization. Correct. Tear down the town. I just added a video to today's post. The first ever for the "Tattler Network." Look midway down the article. Thanks. Satisfying to see the Sho flushed from his hiding place. His cult is in denial. All the residents of Arcadia and Mayor Tay owe Council Member Beck appreciation for helping Mayor Tay to clarify his apology. The public applauds Mayor Tay's commitment to the truth for the sake of unification. Thank you Council Member Beck and Mayor Sho Tay. 2:06, you call that an apology? What illegal drugs are you on ? You know what denial is, right? A river. Obviously you are now crying one. Don’t worry 7:32, just a matter of time until Tay blows it again and no ‘apology’ will matter. Some how, his ties with master dictator Kinny Hui will lead to his demise. 9:27am Attend more Planning Commission meetings, voice your opinion for stronger FAR. 9:40am. The Treasure of Sierra Madre; "Badges...we don't need no stinking Badges!" Economic poll indicates that the 2018 votes will go in the direction that California voters took; sorry George Soros you lost and will loose. Do you have a cite for this? Be interested in seeing the data. Plenty of room to develop there, fellows. I understand they build McMarsions there. The little green men have large families. Many visitors from other planets and moons too. Long trips. Many comets. Mod, the "Tattler Network" video clip is great. We need more video clips like that to show people what's really happening. A short video is worth 10,000 words. Wish this had been done earlier with the help of concerned volunteers. There were so many lies by Sho Tay and bullying/arrogant behaviors by Chandler in CC meetings over the years. It's time for them to be documented and get exposed to more people. It'll be of great help in future elections. 1:17 Videos are a great idea. Anything that spotlights the truth. I’d bet even Tay’s sheep laughed when he pulled out the consultant lie. Will the lies rate increase, decrease or remain constant? Maybe the city should invest in one of those Politifact Truth-O-Meters. Here’s another lady that “doth protest too much” with a whinney snowflake toddler man. Warning: Once seen it can’t be unseen. Rudy is a very convincing transvestite. Hey wait, we all thought that PC Elitists Snowflakes were Obama supporters. Not anymore. It's blizzard conditions at the swamp. Governor Jerry Brown and Bernie Sanders' illegitimate child, Gavin Newsome, promises all California's Free Everything - just vote fo me, no plans on how to pay for anything, just vote fo me! I'm so pretty, just vote fo me. Cool. Can't wait to vote for him again in November. Pretty Dumb Gavin Newsome Newson, his voters yell...more gas tax for all! As opposed to the jacked up gas prices Trump gave us? Sure, pal. Esports; Arcadian youth wins full scholarship to attend University of Utah -GAMER. Duh, California resident's want to pay doubled taxes for everything beause they are special. NYT: Department of Justice seizes Times Reporter's Email & phone records in Leak Investigation!!! Now will "you" comment on Muller's Massive Abuse? It has nothing whatsoever to do with Mueller, who also works for the Dept of Justice. I stubbed my toe this morning. Obvious Mueller overreach.